Over the past four years, I have endeavored to bring you news and unique insights about the Pelikan brand of fountain pens not readily available elsewhere. Personally, it has been a lot of fun researching some of the more esoteric aspects of the company’s products and history. Because there is so much nuance out there, I sometimes lose sight of the fact that many people still don’t fully grasp the fundamentals or overall landscape of Pelikan’s current line-up. I could drone on about the topic but I thought this may be one area where a picture might just be worth a thousand words. To that end, I have devised an infographic, my first, to serve as a reference for the community. It is my hope that this graphic visual representation of information will allow for a quick and clear understanding of some of the differences amongst both Pelikan’s Classic and Souverän lines. The nature of an infographic prevents it from being all-inclusive but I hope that you will find it a good jumping-off point into the brand’s offerings over the last few decades. Click the link below to jump to the visual. You can stop there but feel free to read on as I will endeavor to walk you through some of the panels of information and expound upon their contents as well as provide relevant links to past posts where appropriate. Since the introduction of the M400 in 1982, many of Pelikan’s model designations have had a more or less standard formatting that allows you to understand much about a pen, perhaps even before laying eyes on it. The first character is usually a letter which represents the type of writing instrument, either a pen or pencil. 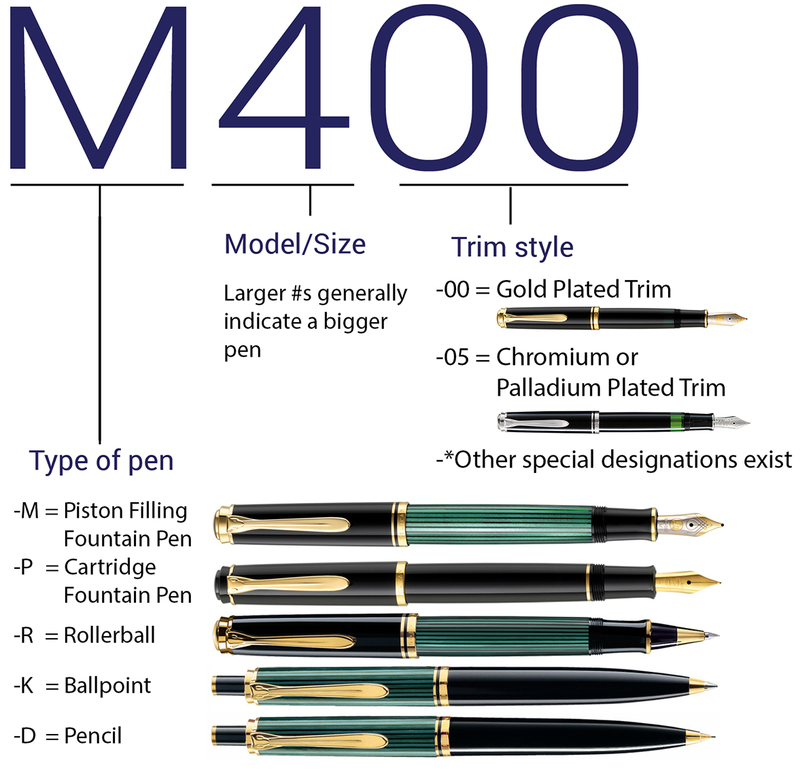 Using the M400 as an example, the ‘M’ designates a mechanik-füller which is a piston filled fountain pen. Other designations include a ‘P’ (patronen-füller) for a cartridge pen, an ‘R’ for a rollerball, a ‘K’ (kugelschreiber) for a ballpoint, and a ‘D’ (druckbleistift) for a mechanical pencil. The second character is a number that denotes the model. In general, the larger the number, the bigger the pen. For instance, an M800 is a bigger piston filled fountain pen than an M400. Exceptions do exist to this generalization since an M200 is bigger than an M300 and roughly the same size as an M400. In fact, many exceptions exists but this rule holds well enough to still serve as a useful guide. Finally, the last two digits indicate the trim style. Models ending in ’00’ have gold-plated trim and those ending in ’05’ have chromium or palladium plating, depending on the line. Beyond those, there are other designations which are used on a case by case basis to describe a special edition such as the recent M815 Metal Striped variant. You can find some additional information about this nomenclature here. All of Pelikan’s piston filling fountain pens use bottled ink. The company has two lines these days, 4001 and Edelstein. Both are well regarded and tend to help tame Pelikan’s wet and generous feeds. Of course, just about any bottled ink made for a fountain pen is suitable for your use. If you have a cartridge/converter pen, then you would need standard international cartridges, either two short or one long, or a converter designed to fit the same. 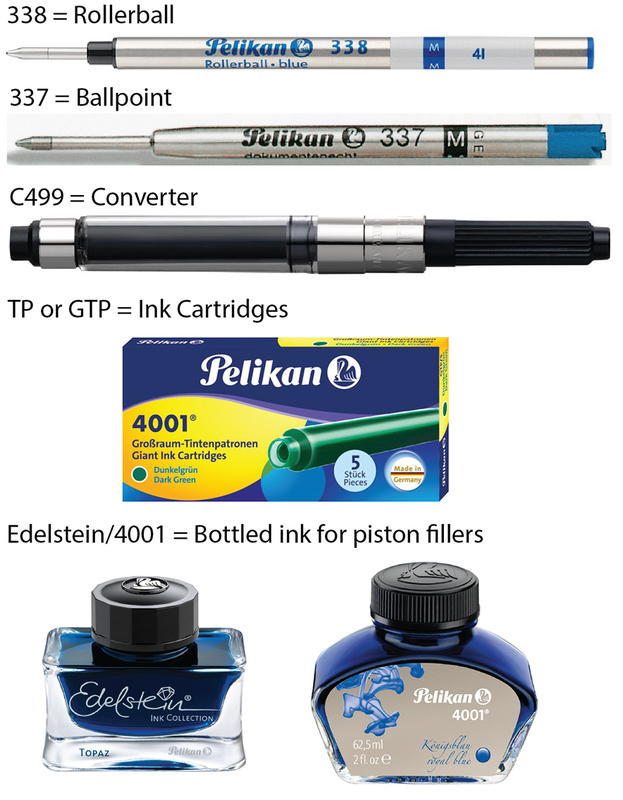 Pelikan’s own offerings include the C499 converter or their ink cartridges which can be found in the same shades as their bottled inks. Pelikan’s implementation of the cartridge/converter system is a bit different from other manufacturers. If interested, you can read more on this topic here. If you have a rollerball or ballpoint, Pelikan makes the 338 and 337 refills respectively. The 338 rollerball refills come in fine (0.8 mm), medium (1 mm), and broad (1.2 mm) in either blue or black ink. The 337 ballpoint refills come in the same line widths and colors as the rollerball with the addition of red ink in a medium width only. Ever wonder what all of those parts on your Pelikan pen were called? This section is meant to help with that. Regardless of the manufacturer, nibs have a basic nomenclature associated with their components which is universal. For those with a keen eye, you might recognize that the illustration below utilizes an M1000 nib. How can you tell? Even without the pen, these can be readily spotted because of the double scroll work, something only found on M1xxx nibs. Pelikan has made a large variety of demonstrators which give us a detailed look at a pen’s inner workings. In this illustration, an M805 Clear Demonstrator (2015) was utilized. The photo below depicts the model without engravings however a version was available for purchase that already had all of these parts labeled right on the pen. Pelikan’s Classic line represents an entry level tier, largely championed these days by the M200 and M205. 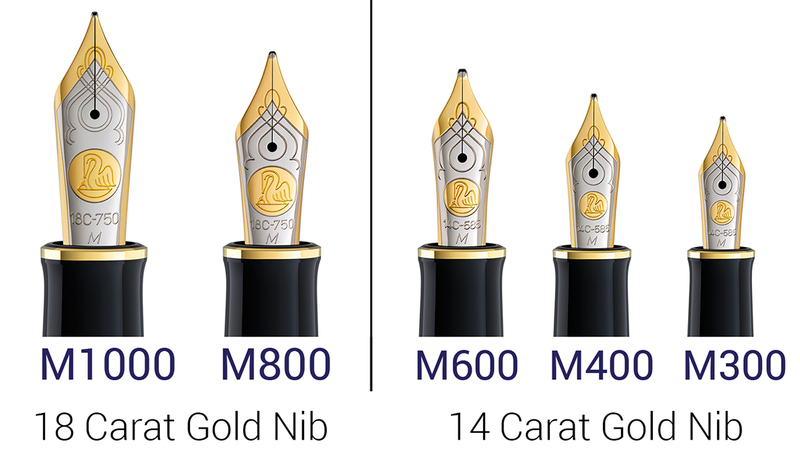 The M200 has a gold-plated stainless steel nib and the M205 is fitted with an unplated version. I find these to generally write true to their designation and have a pleasant bit of spring to them which makes for an enjoyable writing experience. The Souverän series has gold nibs, perhaps one of the largest distinctions between the two lines. These come in either a two-tone or monotone look with 18C-750 nibs coming standard on the M1000 and M800 and with 14C-585 nibs fitted to the M600, M400, and M300 models. Depending on the region of sale, you can also find 12C-500 and 21C-875 variants (amongst others) which are a unique novelty but don’t essentially contribute to any noticeable difference in performance. Pelikan’s stock nibs generally have a rounded tipping which is consistent across the board. Their standard widths include EF, F, M, and B. You can sometimes find BB or IB nibs offered for sale which contributes to a welcomed bit of variety. Oblique nibs are no longer in production and haven’t been for the past 5 years but remain highly sought after on the secondary market. Of course, there is always the option of a custom grind which can really add character and expression to just about any stock nib. One of the big questions that seems to get asked a lot is what are the differences between the Classic and Souverän lines. In practical application, the best answer is likely “not much.” Sure, the Souveräns have a shinier coat of paint and some fancier gilding but both lines make for reliable, durable writers. As you can see highlighted below, the differences are mostly cosmetic. If a gold nib is on your must have list, any M200 stainless steel nib can be swapped out for an M400 14C-585 nib in a matter of seconds. In addition to aesthetics, prices between the two lines are probably the starkest difference with the Classic series coming in as a higher end entry level model and the Souverän series showing it’s luxury roots throughout with prices that more than doubled when moving from the smallest to the largest of the models. 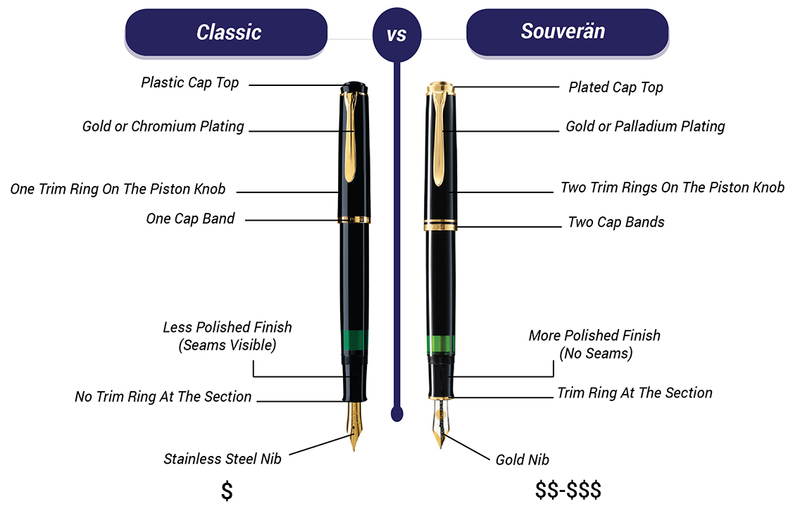 Amongst the Souverän models, each pen produced since 1997 has a different sized nib. The M1000 is the largest by far with the M300 appearing rather tiny in comparison. There is some interchangeability and nibs can be swapped between certain models. For example, an M600 can accept nibs from either an M200, M400, M600, or M101N. If that interplay between models is important to you, your best bet is to stick to the M200, M400, and M600 models. You can read more about cross model nib compatibility here. Often times, it’s hard to gauge a pen based on statistics alone. I have endeavored below to show the models relative to one another in order to convey at least a small sense of proportion. Also included is an approximate length of the pen when posted which I find to be hard information to come by but important to people like myself who routinely post their pens. Ink capacity is also a big question that often comes up. You would think that an M1000, by virtue of its size, would hold a significantly larger amount of ink than an M400 but that simply isn’t the case due to the design of these pens. All of the measurements here, except for the posted length, were adapted from Pelikan’s own sales literature. Finally, I also included for you the U.S. MSRP for each of the standard models according to the most recent price list (dated 2/2017). The minimum advertised price in the U.S. is usually 20% below MSRP and those prices are also reflected below. While there are occasional sales, discount codes, and regional variations in pricing, I hope that these price points can serve as a useful guide. Prices overseas are usually lower than what is found in the U.S.A. therefore you can find a decent bit of variability depending on where you choose to shop. I hope that my infographic is able to convey the information in a precise manner and that you may find it useful as a reference. It is free to be shared provided you do so in its entirety, without alteration or modification. Let me know what you think in the comments below and whether or not you have found this useful. Also, I’m always happy to expand upon any of the addressed topics that you might wish further clarification or insight into. If you haven’t already done so, you may also want to check out my article “A Guide to Buying Pelikan” which addresses some of these topics and so much more. Thanks and you’re welcome. Yes, they go well beyond just fountain pens. I have a very nice set of M400, K400, R400, and D400 circa 1982, all marked W.-Germany. Makes for a great set with a tool for any writing task that you may encounter. Enjoy the Hub in Richmond! Glad you like. There is a lot to love. A world of information, Josh, in a tight but somehow uncrowded space…well played—a terrific service! I apprececiate the positive critique Jack. A lot of thought and multiple discarded drafts went into it but am very satisfied with the final product. Joshua; what a fantastic INFOGRAPHIC on Pelikan pens & related products. I am amazed at the quality of the writing, pictures, and graphics. Bravo!! You’re always too kind to me Francis but thanks. Sorry to have missed you in D.C. this year. Hope you are well. Beautifully done, Joshua. It will be very handy to have all these comparisons in one place. Thanks! Was hoping to create one stop shopping for the modern lines. Hopefully, it will fulfill its purpose. Thank’s very much for all information about Pelikan. I need all to choice new articles to me! An outstanding result of all the hours you have put down on this. This will be a reference for many years! Excellent my dear colleague! This is a wonderful chart. Thanks for taking the time to make it. You mention the M101N in the Souveran nib sizes section but I don’t see that pen listed on the chart. Can you tell me more about it or guide me to someplace I can learn more please? You’re welcome. The M101N is a great pen. There have been 4 of them to date, the last one coming last year. You can read more about them on my site here, here, and here. I hope that helps you out. I appreciate the kind words Fred. Thanks! This is incredibly well done! I don’t think I’ve ever seen such a clear and concise presentation of so much useful information. Thanks Dan! You flatter me with your appraisal. Maybe in the future, we can do one with nib grinds. Joshua, I just can’t thank you enough for this article and the information it contained. Eagerly awaiting the proposed article on nib grinds. Thanks! I’m glad you’ve found it helpful. Perhaps Dan and I will come together on that infographic one day. In the meantime, have you read my article on custom nib grinds? What a great summary of all things Pelikan! Thanks – as always. Great post; incredibly helpful and informative! Joshua: Really terrific–especially with the upcoming Hubs–will put on my iPAD for easy reference! That’s a good idea. Bet it would make a nice reference on the iPad. Amazing source of information Joshua, thank you for the inspiration! Thanks! I hope that it serves you well. Just got around to actually reading this blog due to its complexity. Very well written and the illustrations make it all very clear. Thanks for taking the time to write this article! I’m sure I will refer back to it again in the future. My hope is that it will serve as an enduring reference. I’m glad you found that it brought some clarity to the Pelikan landscape. Hi Dr Joshua I heard about you and your unique blog through another Dr. I already thanked him for this great information but now I have to thank you for this amazing opportunity to know more about this fantastic topic and this particular brand: Pelikan I’m looking forward to buy one of this unique fountain pens and enjoy the experience of handwriting again something that it’s not my main thing anymore because the new increasing use of iphone and other technology. Anyway thanks again for your time on this priceless information that it is so much appreciated. DS. I appreciate your kind words. You are most welcome. Thanks for reading and please let me know if I can be of any service to you in the future.